As the most common cancer among women, breast cancer is understandably feared, and discovering a breast lump can be a traumatic experience. Fortunately, most breast lumps are not cancerous. However, for the minority that are, much research has gone into their treatment. Surgery has moved away from the radical mastectomies of a few decades ago. Breast reconstruction is often an option. Chemotherapy, radiotherapy, hormone therapy and targeted therapy are additional weapons that doctors have at their disposal. Q. What is breast cancer? A. Cancer is a disease where the body’s cells multiply more rapidly than normal. This uncontrolled increase in the number of cells results in a lump which is known as a tumour. Cancers that start in breast tissue are called breast cancer. Cancer cells can invade nearby tissues and organs and can also spread through the bloodstream or lymphatic system to other parts of the body. This is why doctors check the lymph nodes under the arm if you have breast cancer — to see if the breast cancer cells have spread to the lymph nodes via the lymphatic system. Q. Are all breast lumps cancerous? A. Not all breast lumps are cancer. In fact most breast lumps are benign — this means non-cancerous. Fluid filled sacs, called breast cysts, are a common cause of benign breast lumps. They can change size and become tender around the time of your period. Fibrocystic changes are another common cause of benign lumps in the breast, causing breast cysts (which often feel round and mobile) and fibrosis (the formation of fibrous tissue, which is like scar tissue, that may make your breasts feel firm, hard or rubbery). A type of benign breast lump called a fibroadenoma is a solid, smooth, firm, round lump which can be moved under the skin when prodded. Fibroadenomas often occur in women during their reproductive years. Benign tumours are not cancer and don’t spread to other parts of the body. A. It is usually not clear what causes the cells to multiply abnormally in breast cancer. The exact cause is unknown. Breast cancer is a complex disease with many interrelated factors and doctors still have much to discover about it. Q. How would I know if I had breast cancer? redness, itching, sores or scaly skin on any part of the breast. If you notice any of these changes, you should visit your doctor as soon as possible to have them checked out. Another way that breast cancers are found is through screening mammograms - a special type of breast X-ray that can be used to detect early breast cancers before they cause any symptoms. Mammograms are capable of detecting tumours that are too small to be felt. This enables treatment to start sooner than if the tumour was detected when it was larger and able to be felt. The sooner treatment starts the better. BreastScreen Australia recommends mammograms for women aged between 50 and 74 every 2 years. Breast tissue in young women is usually quite dense and mammograms sometimes may not detect lumps. This is why regular mammograms are not usually recommended for women under 40 — along with the fact that breast cancer is rare in younger women. BreastScreen Australia will perform free screening mammograms to women over 40. Q. What about breast self-examination? A. Breast awareness, which simply means being familiar with the way your breasts normally look and feel, is important because it can mean that you notice any lumps or changes to your breasts sooner. Early detection of breast cancer increases the likelihood of successful treatment and cure. Most women find that regularly examining their breasts in front of the mirror and/or feeling for changes in the shower are a good way to be breast aware. If you do feel or see anything that you think is new or different, see your doctor. While it’s important to have any breast symptoms checked, try not to worry too much. Most breast lumps turn out not to be breast cancer, but it’s always best to get them checked by your doctor straight away. Q. Can I inherit breast cancer if it’s in my family? A. You may be at increased risk of breast cancer if you have a close family relative (mother, sister or daughter) who developed breast (or ovarian) cancer, especially if they were diagnosed at a young age. Most women with a family history of breast cancer, however, do not develop it. In fact 8 out of 10 women who get breast cancer do not have a family history of it. There are inherited defects in several genes that have been shown to put women more at risk of breast cancer. BRCA1 and BRCA2 are 2 of the genes. Women who have inherited specific mutations in either of these genes have a high risk of developing breast cancer, and also ovarian cancer. Q. What will increase my risk of getting breast cancer? A. Many factors have been identified that increase the risk of a woman getting breast cancer. Family history is one, which we’ve just discussed and it can’t be changed. Here are some other risk factors that you can’t influence. Age — as you get older your risk of developing breast cancer increases. Breast cancer is more common in women over 40. Having already had breast cancer. Having a defect in the BRCA1 or BRCA2 gene — as discussed, having a defect in these genes increases your risk. If your first period came before age 12 or you had a late menopause (after 55), you are exposed to oestrogen for longer than other women and have an increased risk of breast cancer. Having been previously diagnosed with a breast condition such as atypical hyperplasia, ductal carcinoma in situ (DCIS) or lobular carcinoma in situ (LCIS) increases your breast cancer risk. Having been exposed to radiation in the past, such as for previous cancer treatment. Q. Are there risk factors that I may be able to influence? A. Yes, here are some risk factors that you may be able to influence. Excess weight — putting on excess weight increases your risk of breast cancer. Alcohol consumption — having more than 2 standard drinks of alcohol per day is associated with an increased risk of breast cancer, and the risk is further increased with each additional standard drink per day. Taking combination (oestrogen and progestogen) menopausal hormone therapy (MHT) - also known as hormone replacement therapy - may increase the risk of developing breast cancer. The risk increases the longer you take MHT, but then reduces over time once it is stopped. Taking the oral contraceptive pill slightly increases your risk; however, once you stop the pill the risk level returns to normal within 10 years. Q: Is there anything that can reduce my risk of breast cancer? breast feeding for a total of 12 months or longer. Q. Will taking hormone replacement therapy (HRT) increase my risk of breast cancer? A. Women taking combined hormone replacement therapy, also known as menopausal hormone therapy (MHT) may be at increased risk of developing breast cancer. Combined formulations contain oestrogen plus progesterone. The risk seems to increase the longer you take combined MHT, but when you stop taking it your risk of breast cancer declines. MHT can still be used as a short-term treatment for moderate to severe menopausal symptoms, for instance to relieve hot flushes, but treatment needs to be reviewed with your doctor regularly — at least every 6 months. Q. Are there different types of breast cancer? A. Yes. The most common type of breast cancer starts in the ducts and is called ductal carcinoma. 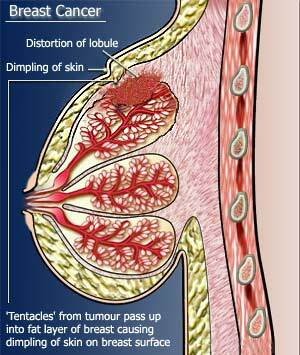 Lobular carcinoma starts in the lobules of the breast. The lobules are the small sections of the lobes that end in lots of tiny bulbs where breast milk is produced. About 2 out of 3 breast cancers are hormone receptor-positive, meaning that they can be stimulated to grow by hormones, such as oestrogen and progesterone. These cancers are known as oestrogen receptor-positive and progesterone receptor-positive, because they have oestrogen and/or progesterone receptors on the surface of the tumour cells. Tumours that are hormone receptor-positive are more common in older women and tend to grow more slowly than hormone receptor-negative tumours. They often respond to treatment with hormone-blocking medicines, such as tamoxifen. About a quarter of breast cancers are HER2-positive, meaning they have high levels of a protein called human epidermal growth factor receptor 2 (HER2) on their surface. HER2 proteins stimulate the growth of the breast cancer, and HER2-positive cancers can grow and spread faster than other types of breast cancer. However, there are specific treatments for these breast cancers. Q. How is breast cancer diagnosed? A. When you go to your doctor after finding a change in your breast, the next step is usually that the doctor examines the breast and then will send you for a mammogram, and possibly also an ultrasound. Ultrasound can distinguish between a solid lump and a fluid-filled cyst. Ultrasound is also used in younger women because their breast tissue is usually quite dense, making it difficult to detect lumps on a mammogram. If these tests show a lump or other suspicious area, your doctor will probably suggest a fine needle biopsy to take a tiny sample of the cells from the lump. A more substantial biopsy may be taken if necessary. If a biopsy finds cancer cells, then more tests are carried out to find out the characteristics of the cancer cells. For example, do they have hormone or HER2 receptors? Are the cancer cells of the type that will spread quickly or not? A pathologist will examine the cells taken from a biopsy to get a picture of the cancer cells and how they might behave. Q. How will I know if the cancer has spread? A. If breast cancer is diagnosed, your doctor may order blood tests, bone scans or X-rays to see if the cancer has spread to other parts of the body. When breast cancer does spread, the first place it is usually found is in the lymph nodes in the armpit, so doctors usually recommend testing the lymph nodes to check for any breast cancer cells. Q. What is sentinel node biopsy? A. Sentinel node biopsy is a technique whereby a surgeon injects blue dye or a radioactive tracer into the breast near the tumour. As the dye or tracer drains away into the lymph nodes in the armpit, the surgeon can see the first lymph node that the dye reaches. This is the sentinel node. The surgeon removes the node, examines it and sends it for testing to see if it contains cancer. The sentinel node is a good indicator of the status of the other lymph nodes that the tumour drains to. If the sentinel node contains cancer, it is removed, along with its surrounding nodes and any other suspicious nodes. But if the sentinel node is clear, removal of the lymph nodes may be unnecessary, and so the risk of surgical side effects such as lymphoedema can be reduced. Q. What are the treatments for breast cancer? A. If a diagnosis of breast cancer is made, your doctors will tell you the options you have for treatment, based on the type of breast cancer you have and how far it has spread. Breast cancer treatment options include surgery — breast-conserving surgery or mastectomy — radiation treatment, chemotherapy, hormone treatment and targeted therapy. Sometimes a combination of treatments is needed. Q. What are the different types of surgery? A. Surgery will either be to remove the whole breast (this is called mastectomy) or the tumour and some of the normal tissue surrounding the tumour (this is called breast-conserving surgery). One type of breast-conserving surgery is lumpectomy, where the cancer is removed along with a margin of normal tissue from around it. Surgery also usually involves removal of some of the lymph nodes from under the arm. The most common treatment for early breast cancer is breast-conserving surgery with removal of the lymph nodes followed by radiotherapy. Q. Are there any side effects from surgery? A. Your doctor will talk to you about possible side effects from surgery. One possible side effect of breast cancer surgery is lymphoedema. This sometimes occurs when lymph nodes are removed from the armpit and lymphatic fluid is not drained as well from the arm. The fluid builds up, resulting in swelling of the arm. Lymphoedema may affect one in 5 women after breast cancer surgery and is more likely to occur if you also have radiotherapy to the armpit. Q. Will I be able to have a breast reconstruction? A. Many women who have a mastectomy choose to have a breast reconstruction carried out. It can be done at the same time as the mastectomy or later. There are a few methods of breast reconstruction and your doctors and surgeons will be able to advise which are suitable for you. Not all methods will be suitable for everyone. Women who have breast-conserving surgery may be offered a special type of surgery called oncoplastic breast-conserving surgery. This type of surgery combines surgery to remove the cancer with plastic surgery to preserve the appearance of the breast as much as possible. A. Radiotherapy is commonly recommended following breast-conserving surgery to kill any undetected cancer cells and reduce the risk of the cancer coming back. It is also sometimes given after a mastectomy. Radiotherapy uses high-energy X-rays to kill cancer cells. It is usually carried out a couple of weeks after breast cancer surgery. A usual course of radiotherapy for early breast cancer would involve treatment 5 days a week for between 4 and 6 weeks. You may need to have a mark put on your skin so that the radiation is directed to the correct area. The radiation doesn’t hurt and you shouldn’t feel any discomfort. Radiotherapy to the breast does not make your hair fall out, but near the end of your treatment period you may feel tired and your skin may take on a sunburned look where it has been treated. Q. Are there medicines to treat breast cancer? A. Nowadays, many breast cancer patients are offered treatment with hormone therapy or targeted therapy. These treatments can help reduce the risk of the cancer coming back, and can also be used to treat advanced breast cancer. Hormone therapy may be recommended if your tumour is oestrogen receptor-positive and/or progesterone receptor-positive — that is, it has oestrogen and/or progesterone receptors on the tumour cells. The type of hormone therapy given will depend on whether you have been through menopause, your age and the type of breast cancer you have. Options include tamoxifen, aromatase inhibitors (such as anastrozole, exemestane and letrozole) and ovarian treatments (including surgery to remove the ovaries, radiation to the ovaries (which is rarely used), chemotherapy or a hormone implant called goserelin). Women with HER2-positive breast cancer may benefit from targeted therapy with a medicine called trastuzumab (brand name Herceptin). Herceptin targets the HER2 protein, attaching to the HER2-positive cancer cells and killing them or stopping them from growing and dividing. Targeted therapy is often used together with chemotherapy. Q. When is chemotherapy used for breast cancer? to treat advanced breast cancer. Chemotherapy is often recommended in combination with targeted therapy for HER2-positive breast cancer. There are tests available called gene expression tests that can help work out which types of breast cancer will benefit from treatment with chemotherapy. Common types of chemotherapy given to treat early stage breast cancer include doxorubicin, cyclophosphamide, fluorouracil, docetaxel and paclitaxel. It is usually most effective to have several types of chemotherapy given in combination. Many different combination chemotherapy options are available - there is no single combination that is clearly the best for all people with breast cancer. Chemotherapy for breast cancer is usually given intravenously - through a vein. Some types of chemotherapy (usually those used for advanced breast cancer) can be given as tablets. Side effects from chemotherapy may include temporary hair loss, nausea and vomiting, and tiredness. There are treatments available for side effects, including medicines that can help relieve nausea and vomiting, and cooling caps or cool packs for the scalp that may reduce or prevent hair loss from chemotherapy. Q. What chance is there that my breast cancer will come back? A. It is very difficult to quantify the risk for an individual, as so many factors come into play. Although it’s true that breast cancer can return later on, most relapses happen in the first 5 to 10 years after diagnosis. In terms of outlook, the best chance of cure is when the cancer has not spread beyond the breast at the time of diagnosis. If the cancer has spread to the lymph nodes, the less involved they are, the better the chance of successful treatment - if cancer is found in one to 3 nodes, this gives a better chance than if cancer is found in, say, 10 lymph nodes. The size of the tumour and how the cells look under the microscope are also important. Doctors can often tell how aggressive a cancer is by looking at the shape and form of its cells. They can also do gene expression tests - the patterns of certain genes can help work out whether breast cancer is likely to come back. Surprisingly, some women who have survived a breast cancer diagnosis say that it has had some positives as well as the expected negatives. They say it made them focus on what’s important to them and to their families. Surviving breast cancer made them stronger and made their relationships deeper and more enriched. 1. Cancer Council Australia. Breast cancer (updated July 2016). http://www.cancer.org.au/about-cancer/types-of-cancer/breast-cancer/ (accessed Jul 2017). 2. BreastScreen Australia. About breast screening (updated 5 Mar 2015). http://cancerscreening.gov.au/internet/screening/publishing.nsf/Content/about-breast-screening (accessed Jul 2017). 3. Royal Australian and New Zealand College of Obstetricians and Gynaecologists (RANZCOG). Menopausal Hormone Therapy Advice (July 2015). https://www.ranzcog.edu.au/RANZCOG_SITE/media/RANZCOG-MEDIA/Women%27s%20Health/Statement%20and%20guidelines/Clinical%20-%20Gynaecology/Menopausal-Hormone-Therapy-Advice-(C-Gyn-16)-Re-write-July-2015.pdf?ext=.pdf (accessed Jul 2017). 4. American Cancer Society. Breast cancer. https://www.cancer.org/cancer/breast-cancer.html (accessed Aug 2017).